Well, at first I was like, "I'll hold off on this for a while." but that's a stupid idea. If I'm on a streak I should just toss up everything I get. If I ever run out of ideas I have a handful of 'good enough' pictures I could use to fill in the site for those of you who like this site. 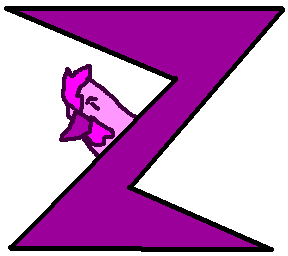 Z! The final letter finally arrives in all of it's striking beauty. The sharp points bring out their full force against you. The chicken casually peeks out from behind it, haughtily mocking you! Are you just going to accept that!? Probably yes. After all that chicken's hiding out behind that stylish Z. For those of you who are curious as to why this isn't the end of the Alphabet of Chicken project my answer is this... El-em-En-Oh never sounded like one letter and I'd never know how to draw it anyways.